House Transportation and Infrastructure Committee Chairman John L. Mica (R-FL) has announced the locations for a series of national field hearings and public forums to be held in February on pending surface transportation legislation. Hearings will take place in the following communities: Beckley and Charleston, WV; the Philadelphia, Chicago, and Memphis metropolitan areas; Scranton, PA; Rochester, NY; Columbus, OH; Indianapolis, IN; Vancouver, WA; Los Angeles and Fresno, CA; Oklahoma City, OK; and Jonesboro, AR. APTA just released the results from a new business member survey. Key finding: 80 percent of private sector businesses surveyed indicated that the level of federal investment in public transportation has a large influence on business revenue. The survey also painted a grim outlook for the industry if the federal surface transportation authorization is further delayed, with 84 percent of respondents predicting revenue losses. See the Feb.14 issue of Passenger Transport for more details. FTA has added links to its grant programs pages that enable users to sign up to receive periodic updates about funding availability, award announcements, and other significant program information. Click the E-mail Update tab at the top of the grant program page(s) you would like to follow to start receiving details. The task force charged with selecting APTA's next president is seeking comments from APTA members on the qualities and attributes most important for the position. The Presidential Selection Task Force, appointed by APTA Chair Michael Scanlon, has set up an online area where members can both track the status of the process and submit their comments and suggestions electronically. Latest news concerning APTA’s Legislative Conference! FRA Administrator Joe Szabo will speak on Monday, March 14, during the afternoon session beginning at 1:45. The panel, designed for key administrators to provide program updates and discuss policy initiatives, also includes FTA Administrator Peter Rogoff. Stay tuned ... more information to come. To register, contact Meredith Slesinger. Start thinking now about registering for the Fare Collection Workshop, to be held in Miami on March 28-31. The Workshop will be held in the same hotel (Hilton Miami Downtown) with overlapping dates as TransITech. This new partnership will include programming on Tuesday and Wednesday that is relevant to registrants of either event. There will also be a joint lunch on Tuesday featuring Peter Appel, Administrator of the Research and Innovative Technology Administration (RITA). After lunch, both events will transition into a combined and expanded vendor showcase ending in a networking reception. 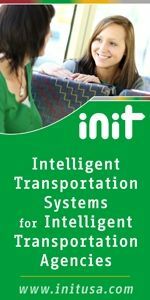 This is a “must attend” event for any transit professional interested in the future of fare collection technology. Don't miss out. Contact Bill Baum. The Fort Worth Transportation Authority is prepared for the thousands of visitors expected on Super Bowl Sunday, including rolling out eight new 80-passenger articulated buses that can hold nearly triple the number of passengers of most of its fleet. Google engineer/programmer/designer Alexander Chen has created an interactive NYC subway map-turned-musical-instrument that uses transit lines as its strings. The Atlanta Journal Constitution has an update from a Duke researcher on its examination of the U.S. potential for manufacturing passenger railcars.